Tools: mixing glass, strainer Glass: cocktail glass Garnish: Maraschino cherry Pour all ingredients into a mixing glass filled with ice cubes. Stir well. Strain into the chilled cocktail glass. Garnish with a cherry. The Manhattan has a rich and storied history, much of which is probably false. Many claim that the Manhattan was created in 1874 at the Manhattan Club in New York City for a dinner party hosted by Winston Churchill’s mother. However, several historical records actually place her in Europe on the evening of the event, and pregnant, so hopefully there’s a reasonable explanation. Maybe someone was impersonating Lady Randolph Churchill? Perhaps a secret twin? The truth is lost to time. Prior to the 1870s, there are other references to similar cocktails also called “Manhattan” being served throughout the namesake borough. But most sources seem to give credit to a bartender that history remembers only by the name of “Black.” From the 1880s, he served up this classic cocktail for over 30 years from behind the bar at the Hoffman House. 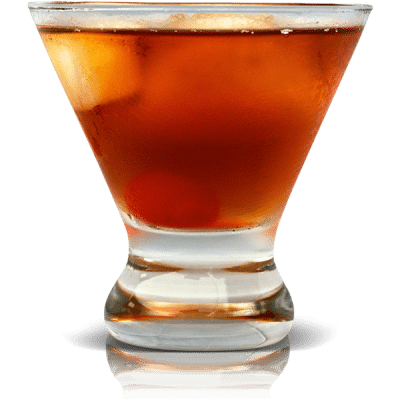 While the Manhattan’s true history will most likely remain shrouded in mystery, that shouldn’t stop you from mixing up a Manhattan of your own to toast to the anonymous creator. We humbly suggest the recipe below.